Friday 5:00 to 6:15PM is team check-in, pick up shirts and meet your coaches and teammates. Saturday 9:30AM- FLEXX Sports begins evaluation. Your team will be pre-scheduled throughout the day for evaluations. Saturday 6:45PM- FLEXX will conclude evaluations for the weekend. 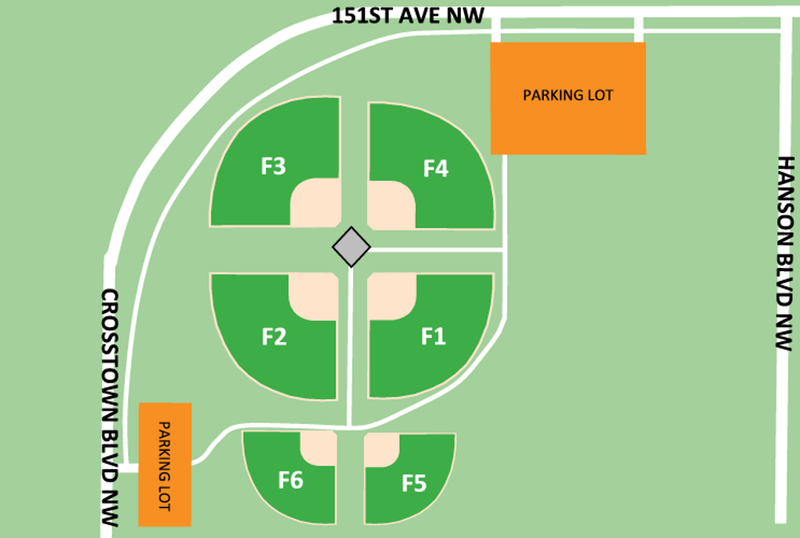 Games will be held on fields 1-4. FLEXX evaluations on fields 5-6. 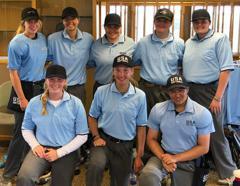 Minnesota Softball is dedicated to providing fair & competitive softball for all softball disciplines. Welcome to the USA Softball Selects nomination. We are excited for the players you are about to nominate to the Select Teams. We feel this will be a great way to recognize your community players for the commitment they have made to your organization. These players should be Selects in every sense of the term. They should be great players and great kids. Click on the above The USA Selects Logo to nominate players and apply to be a coach. Location Sunshine Park, Andover, MN. Dates are August 10th to August 12th, 2018. Opening ceremonies and check in will be on August 10th and games and evaluations by FLEXX Softball will be on the 11th and 12th. The cost to participate is $75.00 per player. Team coaches and community directors are the ONLY people allowed to fill this form out. We will confirm with association directors. New format for players being nominated. Coaches will again nominate a maximum of two players. Once received FLEXX Sports will send the nominated player/parent a private link to register and pay for their child. If you have an account with FLEXX Sports you can log in with that email and password. Payments must be received upfront this year. This years jersey we will not be putting last names on. The uniform number you enter on the following form is what is going to end up on the back of the players shirt. The registration period will be from June 1st to July 30th (this date has been extended). We cannot take late registrations because we have to get information to printers and embroiderers. There are NO EXCEPTIONS. Players can expect to be separated. We are trying to create equal teams. The kids are capable of making new friends and will. Parents should not ever call our office. Work through your directors. Coaches before nominating your USA Select player please get the correct spelling of the last name of the player, shirt size, and jersey number. Coaches, we are always looking for coaches to coach. If interested please consider volunteering. At the bottom of the player nomination form we add a simple yes or no do you want to coach and and a question on your shirt size. New format: We have teamed up with FLEXX Softball and will incorporate them in the USA Softball Selects weekend. Here is how registration will work. The coach will go to the link at the top of this page and nominate up to 2 players. This will go straight to FLEXX. FLEXX will then send and invitation to the parent to accept the nomination and pay through the FLEXX software. The USA Softball Selects weekend will be on August 10-12th. Check-in and opening ceremonies will be on August 10th. Three scheduled games and evaluations will be on the 11 and 12th. The players along with their team will be evaluated on the following items. FLEXX Sports Evaluation Schedule To be done as a team. Click on USA Select Logo to Nominate. This event is a fun end of the year celebration for the children and coaches that play softball within community based associations. Teams will be divided as equally as we can make them. Your players may NOT end up on the same team. There will be kids of varying skill levels on all teams. If you are not nominating and players but want to coach-click here!